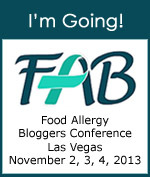 Have you been waiting on the Food Allergy Bloggers Conference agenda, before buying tickets and booking your travel? Well, here it is! We want a conference to include EVERYONE: Advocacy leaders, non-profits, doctors, researchers, parents, and patients, and the companies who provide solutions that support them. Anyone connected to food allergies, asthma EoE, celiac disease, or food intolerances is welcome. We are united, fighting many of the same battles with our diseases. We know one another- through our virtual interactions, shared experiences, support, outrage, and tears. The power and excitement that happens when we all finally get to actually meet each other is palpable! We invite you, blogger or caregiver, to attend! We are happy to invite any food allergy aware businesses and companies to attend and come participate in meeting and making connections as well to share their products and services! We can NOT WAIT to see you ALL!!! I am ridiculously excited about this event! I remember how excited I was when I attended the Auvi-Q Social Media Summit and I was primarily zoned in on getting my paws on the Auvi-Q and seeing it in the, um, plastic, but then I started seeing the arrivals of the others in attendance, since that was unknown to me before the event and one by one, these people whose work I had been following materialized in the flesh! That summit gave birth to some cherished friendships, even though most of us only got to spend a few hours together. It doesn't take long to bond, though, when you're around people who really GET what your life can be like, at times. Even if it's not a mirror image, your lives have parallels and you have a shared vernacular. We bemoaned the brief amount of time we had together and talked about how wonderful it would be to be able to get everyone in the food allergy community together. That is something that Jenny Sprague, lead organizer of the conference, and blogger at Multiple Food Allergy Help, had been thinking of for quite some time, and now, she has worked very hard (and is still working feverishly) to make this event a reality. I feel that this event is so very important and fills a great need in our community. I know some might think this is just an excuse to go to Las Vegas (and if that's what draws you to it - great! ), but I'm not attending for the location. This will make my 10th trip to LV and it's my favorite vacation spot, but even if we were meeting in the convention center of Hotel XYZ in my own city, I'd be just as thrilled. I'm attending because of those whom will be speaking and all those whom I hope will be in attendance. I imagine us all coming together, becoming a more cohesive unit of advocates, figuring out our common community goals and learning from those we admire and some we have yet to meet. Since cost is always a consideration, I wanted to provide some information and suggestions on making this trip more affordable. The 3 main expenses involved, aside from incidentals, are conference tickets, airfare, and hotel accommodations. For the conference tickets, you can take one easy step and buy your ticket(s) before June 30th, at the Early Bird pricing level. As for airfare, I've done some searching on Kayak.com, but they don't have Southwest Airlines' rates available for comparison, so I did it manually, and if you live in a city that SWA serves, that would be your best bet. I have Rapid Rewards points with them, and the rates are really good, this far ahead! I'm a big advocate for responsible credit use, so I will make this one suggestion to those who are careful with credit. The Southwest Airlines Rapid Rewards Visa card offer 25,000 bonus points, which is equivalent to $400 in air travel, and it is awarded when $1,000 is spent on the card in the first 3 months. (There are 5 months until the conference!) The card has a $69 or $99 annual fee, depending on which one you qualify for, but that is still quite a savings off your airfare. I think everyone should have a credit card with some sort of rewards, if you're going to use credit, at all. If your card isn't currently rewarding you, maybe it's time to switch. We switched from a different rewards card to this card, and just put monthly expenses like gas, groceries and other things on it and pay it off at the end of the month. We were going to buy those things anyway, so might as well earn rewards while we're at it! The hotel rate for the conference is really great for Las Vegas, or anywhere, really! I know here in town, we can't get rates that good! To cut down on costs there, they do allow up to 4 people in a room, with a small additional charge per person and you can also add on the rental of roll-away beds. Splitting the rooms 4 ways, if you're attending solo, brings the room cost down considerably. Even if you split it with just one other person, it's a pretty awesome deal to stay 3 nights in Las Vegas for a little over $100 per person, for the entire stay! OK, so if you're still with me, I hope you will give this conference some serious thought. I will be there and I would absolutely love to see you, too! LOve your post, I have other allergy moms I am trying to lure to come with me ;-) The vacation angle? Heh. Yes, girls' trip!! I think this event/trip can be whatever you make it to be and that's the beauty of it. For me, it's a combination of serious (advocacy) business and serious bonding and fun! For others, it can also be a chance to go to Las Vegas for the first time. It's a fresh, blank canvas of possibility! Fabulous info! Great tips for saving money. Thank you and can't wait to see you, again!